How can you stay current with the legal landscape of the Middle East? 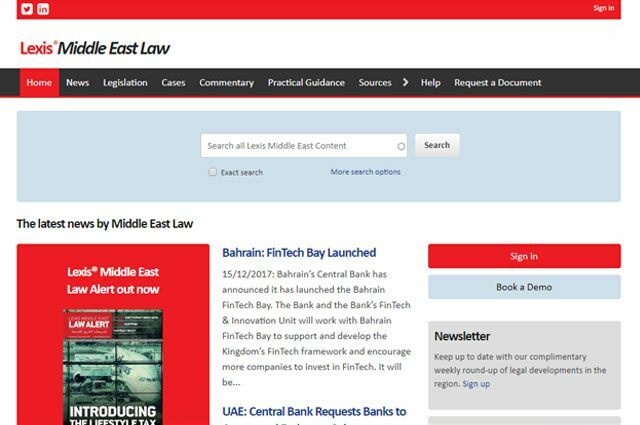 Lexis® Middle East Law provides easy access to news, laws and cases in Arabic and English. The ability to log in to just one consolidated resource that’s intuitive and easy to use is invaluable to us. We were very impressed with the intuitive nature of Lexis® Middle East Law. It's hugely accessible, intuitive and logical to use. 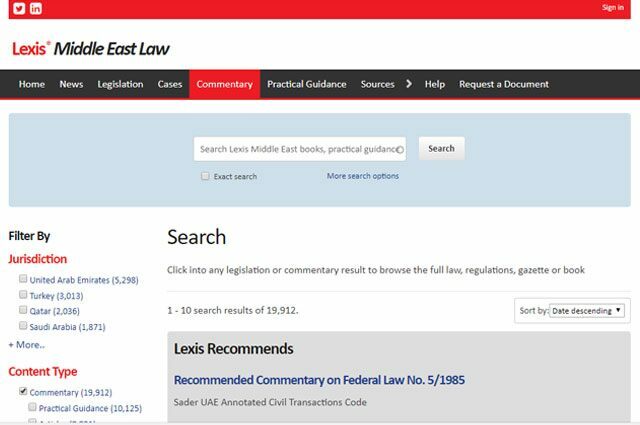 Search and browse Lexis® Middle East Law for the laws and cases of the Middle East in Arabic and English. Carry out in-depth legal research to ensure your clients have the best representation of Middle East Law. Gain immediate access to the latest legislation, regulations, case summaries, commentaries and more. Access the laws of the United Arab Emirates, Oman, Kuwait, Saudi Arabia and Qatar in Arabic with full-text English translations. Find related cases from thousands of case decisions from the UAE courts, as well as the Dubai International Financial Centre Courts, and the QFC Civil and Commercial Court. Access laws, cases and regulations issued by a range of bodies from a single interface, and link directly to relevant legislation and cases in both Arabic and English. Find the latest legal news by country on the home page. Set up email alerts on specific practice areas for information about new and draft laws. Discover the latest gazettes and new laws (federal and emirate) within days of official release. Work with fully amended legislation that’s regularly updated. Find rapid solutions to frequently asked questions, and gain easy access to specially commissioned commentary and practical guidance explaining how to apply the laws in practice. 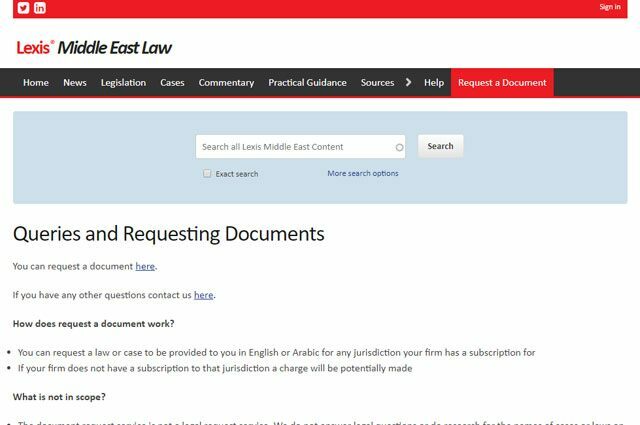 Lexis® Middle East Law is the only tool you need for access to laws and cases across the region. Our core legal news and commentary service covers the whole region; you can streamline costs by matching the service to the jurisdictions you practise in. If you can't find the law or case you're looking for, you can call on our dedicated, responsive research team for help. Cut your translation costs by working with our dedicated, legally qualified translation team.